But it seems rock and roll does age well. We saw X last night and this is a band comfortable with its age. The fact that they’ve had all the decades to become an even more awesome band is the important part. These are first-rate musicians and this is a great band! Billy Zoom wearing my grandfather’s glasses, pleasant grin all night, hardly moving he’s so cool. His fingers fly but he’s not breaking a sweat. Occasionally he licks his pick, sticks it to the middle of his forehead and steps up to the sax to play a bit, grinning for pictures between riffs. More experiment and jazz than I expect. The country-rockabilly influences. The vibraphone just lovely. All wrapped up in solid rock. To my aging concert mates I say: let’s all age well and make the most of all the music. This entry was posted in Home, Live Music Log on September 23, 2017 by madblog. We saw The English Beat at Underground Arts in Philadelphia. Terrible pictures follow. We listened to the English Beat all those years ago in art school but we’ve never seen them before. Wish we had in 1981! Ska is fun, no getting around it. A song about fighting: fun. A song about self-obsession: fun. A anthem calling for your prime minister to step down: fun. A song about mutual selfishness: fun. A song about me ruining three lives, but I didn’t care til I found out that one of them was mine: fun. And best live. Everybody was dancing. There’s something about ska which creates a spirit of solidarity. Twice, big guys tried to push their way to the front and center but everyone held their ground, and told them firmly to go back the way they came. They did, and one of them came back and apologized. My fellow crowd mates weren’t just repelling for their own spot; they were defending our mutual space. Solidarity becomes camaraderie. Dave Wakeling was charming, funny and real. At the end, he shook hands with everyone he could reach, all across the stage. Also, it was nice not be the old person in the crowd. This entry was posted in Home, Live Music Log and tagged English Beat, ska on March 9, 2017 by madblog. We may look back at The Cloud in a few years as one item in a list which also includes cassette tapes, 8-tracks and laser discs. And where will all your music be? In a cloud. Imaginary. Memories. We might have still had all that music, but you melted it. At least it was to make something important. I am afraid that someday we won’t remember Harry James, Dave Brubeck or Chuck Berry because you melted all traces of their work. And some corporation swore to us that they would keep all our music safe for us in a really special secret place and then forgot where it was before it decided it knew what music was best for us. Have you been hearing about this outrage? It seems, at least according to this writer, that once Apple has stored for you all the music that you’ve spent many careful months or years assembling, they don’t see it as your music but theirs. You may think they’re faithfully keeping it safe it for you but when you ask to hear it, it may take some time, they may give you an alternate version which they’ve decided is better, or it may simply have vanished like a dementia patient’s memory. I departed from iTunes a few years ago when they forced me to upgrade and my library vanished. The stuff I had paid for as well as the music I had spent hours patiently downloading and organizing, all gone. I never trusted that invisible somewhere-bank where my cherished music was supposedly kept. I don’t believe it’s in my possession unless I can hold a physical copy. That’s why I’m asking you nicely. Please don’t melt the vinyl. Part 1 here: Don’t Waste the Vinyl! This entry was posted in Home, Live Music Log on May 22, 2016 by madblog. While we blithely trash all of the quaint relics of our past in order to make clever-clever accessories in order to establish our hipster identity, we actually confirm that we do not appreciate the past at all. Our quest to be authentic more often than not displays our cluelessness about the value of the things which are authentically significant. When I was in art school, my studio-mate Andrew one day brought in his rendition of Laurie Anderson’s latest boon to culture and nailed it to the wall. It was her floppy single record which had been inserted in the latest issue of ArtForum, ironed flat. That was a clear and concise statement. No words needed. What do we say when we do this? If you get the brilliance of (artist from at least 20 years ago who has been deemed worthy) more deeply than the general public, you can show that by putting the record on your brand-new vintage suitcase record-player with the tiny speakers and listening to it, but I would recommend that you make a real commitment to authenticity by investing in a system with decent sound quality. That would be reeeeally authentic dude. Maybe talk about the music or the artist, share it with others. 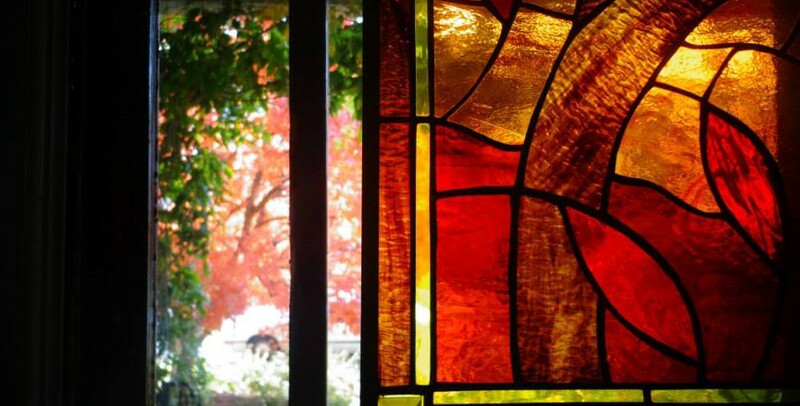 You’ll be bringing ideas, thoughts and feelings from the past into the now, allowing the artist to speak to our culture. The point is, listen to the record. Hear the music, process the lyrics. There may be content in them. The performer may be saying something of substance. Think about it. Enjoy it. Love music. That is what you do with a vinyl record. This entry was posted in Home, Live Music Log and tagged vinyl on April 27, 2016 by madblog. 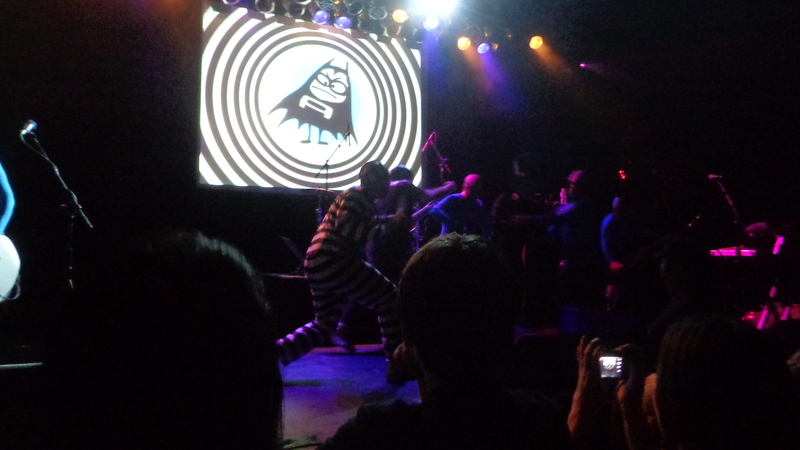 My family and I saw The Aquabats back in October but I never finished writing up my little post about it. It’s a good memory. 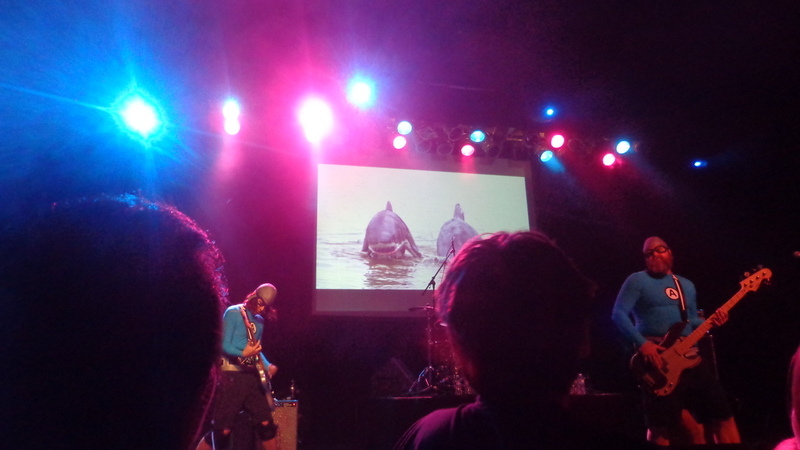 Seeing the The Aquabats is like going to a concert, a Halloween party, and the Monkee’s film “Head” all in one. It’s a mixed ages event because there are parents with little kids, ironic college students, pop-punk music fans, and fans of their TV show, The Aquabats’ Supershow. The show is really ALL ages. It was the second time we saw them at the Theater of the Living Arts in Philly. TLA is the perfect venue for such as they. My husband and I went there to see art movies when we were students at Phila. College of Art (in the late 70’s- early 80’s). It’s where we saw A Clockwork Orange, Performance with Mick Jagger, and many extremely obscure art films meaning films about artists. It’s always been a vortex of cultural literacy. The Aquabats spew pop culture references out of that vortex like Krakatoa. Let me describe: on a screen behind the band are those references in a psychedelic collage which never stops. On the stage are five guys in tights and masks playing Ska-Pop-Punk a la B-52s and being pretty funny. About mid-show, some bad guys in costumes come out and fist-fight with the band. They are exactly what we art students of the fading punk/ new wave era hoped culture would become. We had a blast. There’s always a little drama: Aquabats fighting some bad guys. This entry was posted in Home, Live Music Log and tagged The Aquabats on April 10, 2016 by madblog. My son and I have just been to the best show, at least in the rock genre, that I’ve ever experienced. I got more than my money’s worth. Possibly the best performing band today. Matthew Bellamy was a concert pianist before he picked up a guitar. My untrained ears tell me he’s a very respectable pianist and I know he’s one of our top rock guitarists. Many rock artists with classical training give you rockified pop/classic, some sort of heavy-handed Kool-Aid which tells you they lack deep appreciation for either genre. But MB is straight-up rocker who just happens to have an incredible degree of musical understanding behind him. Several musical genres inform his work and make it rich. They treat their audience well. There were mics set up at various points and MB and bassist Chris Wolstenhome rotated around to them to give a true in-the-round experience. Dom Howard on drums was at center stage. They must have done a couple miles on that stage. Matthew Bellamy is always moving, his performance is intense and physical, usually stalking the stage with his axe. The stage rotated at times. There were lighted balloon drones doing synchronized movements above us. Explosions of person-shaped confetti. Black balloons (for Black Holes and Revelations) bouncing around the theater which, when popped by bassist Wolstenhome, spewed confetti. A light show I won’t try to describe. Several huge translucent panels were lowered and images were projected on them (remember the images had to work from all angles, as you could see through them). And all the elements: music, lyrics, visuals combine to create a total experience. The vision is dark, that of a futuristic techno-totalitarian dystopia. Sometimes there’s a slim secret hope for the downtrodden. Sometimes there’s a lovely lyrical pause in the steady beat of downward control. And sometimes we fight back! Dystopia, but they make it fun. I would like to go back and experience “The Globalist” again. It was the big finale. It’s a gorgeous and riveting 10 minute experience. The grand effects and sadly evocative music combined really worked on me and actually made me think. During the concert. They made it easy for the fans to be up close. This is a band which makes a point of expressing appreciation to its fans. Because of the configuration of the stage, it was easy to be close. I was at two to three people deep. Matthew Bellamy and Chris Wolstenhome were at times ten to fifteen feet away. I could see the individual hairs on their heads. I just never thought I’d get such a great “seat” to such a big band. We bought floor tickets in order to have the option to get to the front and be close to the action, but I was cautious. It’s never easy to size up the type of crowd will be there with you. This is a hugely popular band…will we be crushed against the barrier, should we hang back? When we entered the stadium, we saw there was no option but to be close to the stage. The floor was almost filled with the center stage and two wings in either direction. So we picked a spot around the center stage with just a few people gathering. I was ready to back away lest the crowd start pushing forward when MUSE came out, but it turned out to be a genial crowd. My son Atlee and I had so much fun! People-confetti, light show, person-sized drones. My camera is really awful and I apologize. This entry was posted in Home, Live Music Log and tagged concert, MUSE on February 1, 2016 by madblog. December 11, 2015. Punch Brothers: Chris Thile, Gabe Witcher, Noam Pikelny, Chris Eldridge and Paul Kowert. The Grand Opera House in Wilmington, DE. It was a birthday present for our daughter. Her seat was at the foot of the stage, close enough to feel you’re in the same small room with the musicians, enjoying the music together. It’s Progressive Bluegrass but the term explains poorly; I think you have to be a listener to understand what it means. Five virtuosos who play bluegrass that’s pure bluegrass then Debussy then songs which are bluegrass /jazz /folk /classical all woven together. These men are at the top of the list in their field, and at the top of their game. They are incredible to watch, and to listen to live. Themes are occasionally familiar bluegrass (Boll Weevil). More often they’re about living in a narcissistic and deconstructed world while trying to navigate technology and relationship, usually unsuccessfully. The overriding theme of The Phosphorescent Blues is the compromise of human relationships in a screen-obsessed culture. GOH in Wilmington has the best sound system I’ve ever heard. It’s an opera house, after all. The band was huddled around one microphone. On purpose. You could hear a pin drop from 20 feet away. The musicians are so expert and meticulous that one supersensitive mike was to their advantage. Here are my two illicit pictures. The Grand Opera House in Wilmington doesn’t allow distracting phones and cameras. When my daughter and I share an interest in a band it’s often because she shared them with me. But we discovered Punch Brothers together. The connections went like this: Switchfoot…Fiction Family…Nickel Creek…Chris Thile…Punch Brothers. There’s a vast universe of interrelated music from a few fine musicians who basically work all the time. This entry was posted in Home, Live Music Log and tagged bluegrass, Chris Thile, live music, Punch Brothers on January 9, 2016 by madblog.